View south looking down from the acropolis on the to Agora, Theater, and Harbor of Assos—780 ft. [238 m.] below. 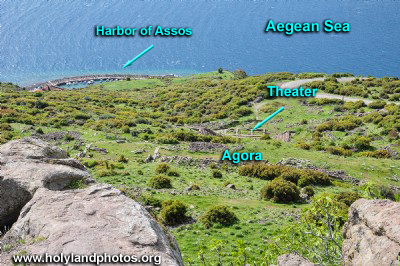 The Agora stretches from left to right across the center of the image. The ends of the cavea of the theater are just visible behind it, and boats in the modern harbor are visible in the upper left portion of the image.